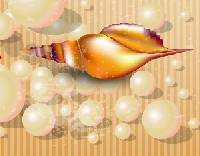 Create 1 ATC for 1 partner with the theme: seashells. All media are welcome, as long as your ATC is the correct size (2.5 inches x 3.5 inches), with a sturdy backing. Please: No sticker slapping! Be sure to place your ATC in a plastic sleeve or other protective envelope before mailing.